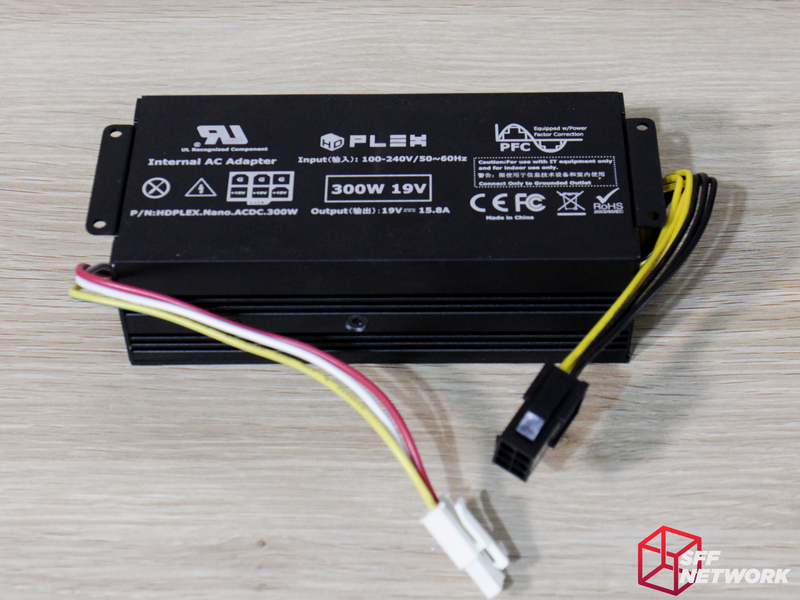 HDPlex provides a product range that covers a lot of the parts you may need to build your SFF rig – AC-DC power supplies, DC-DC Direct Plug ATX power supplies, higher power DC-DC ATX power supplies, adapter plates, flexible PCIe risers and more. 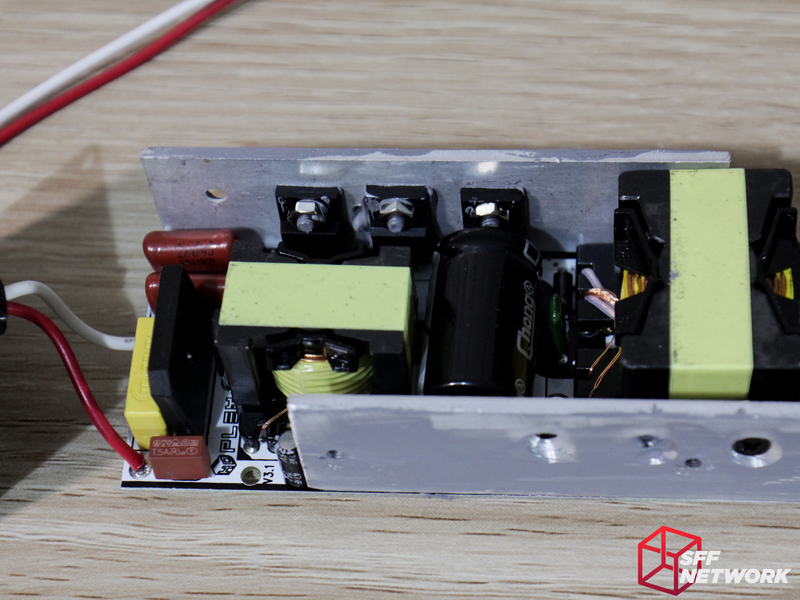 Today, we will look at the AC-DC supplies in the range, the 160 Watt and 300 Watt variants. 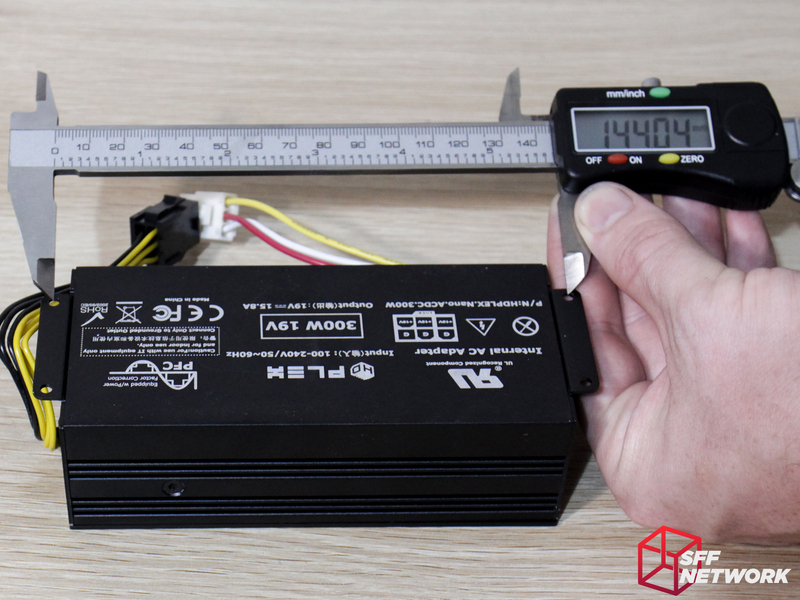 A reliable, high power, 19V power supply has been notoriously difficult to source, especially with the recent Dell power brick counterfeits on the market. 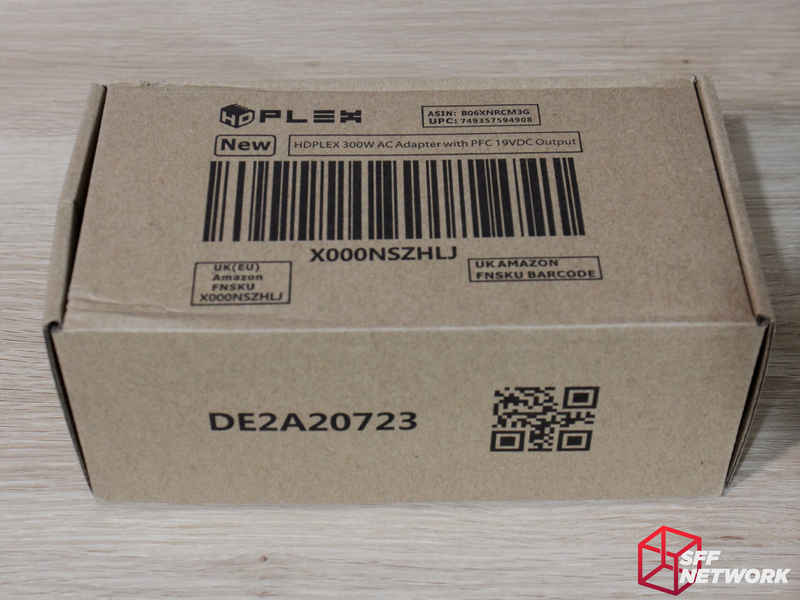 It’s even more important for HDPlex, who has 2 DC-ATX units that rely upon such a power supply! 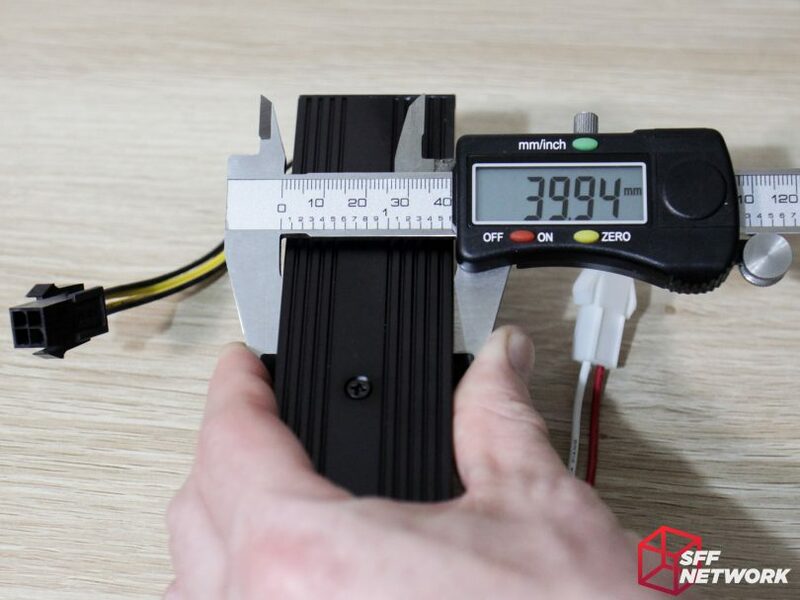 A disclaimer first before we get started: SFF Network does not currently possess the expertise or equipment to fully test the electrical performance of PC power supplies, and as such, this article should not serve as the sole data point in determining whether to purchase this product. 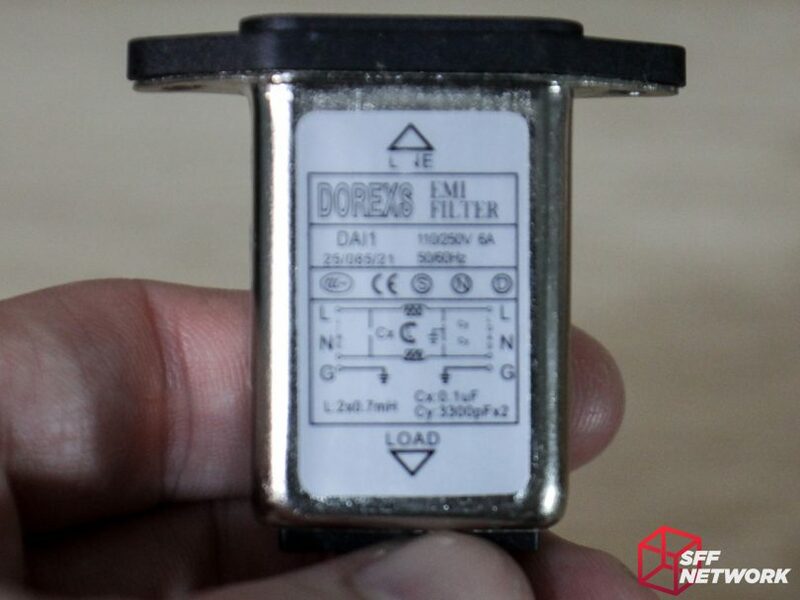 We’ll be able to contextualise the utility and experience of using this unit with others in the market place, but we’d suggest having our own review supplement those by others who have the hardware and capability to do more thorough analysis of electrical performance, especially at higher wattages. 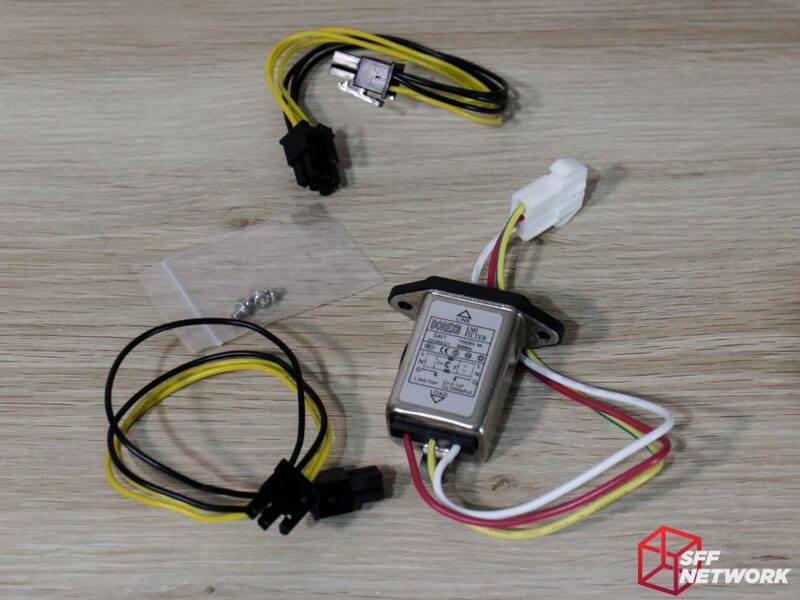 Output 4PIN or detachable 2PIN molex male connector. 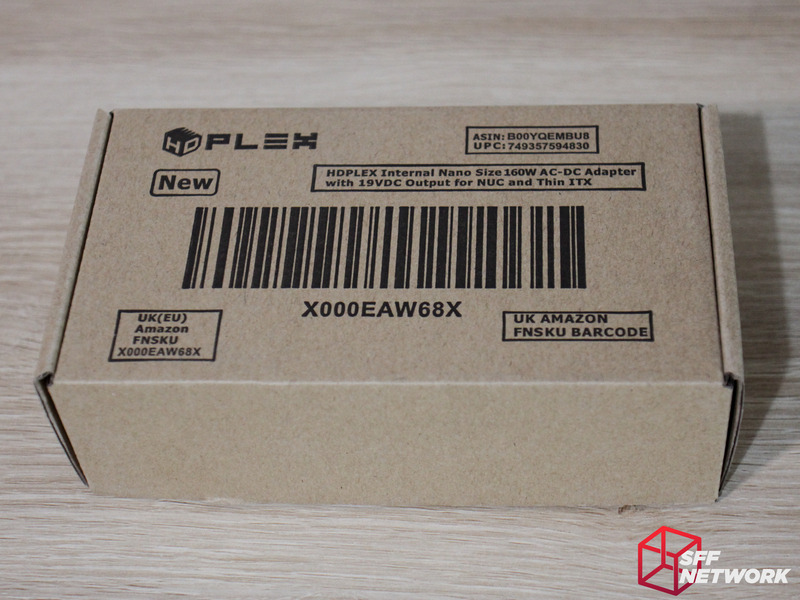 A no frills approach to packaging seems to be HDPlex’s forte – with only a simple black-on-cardboard style, with no marketing. 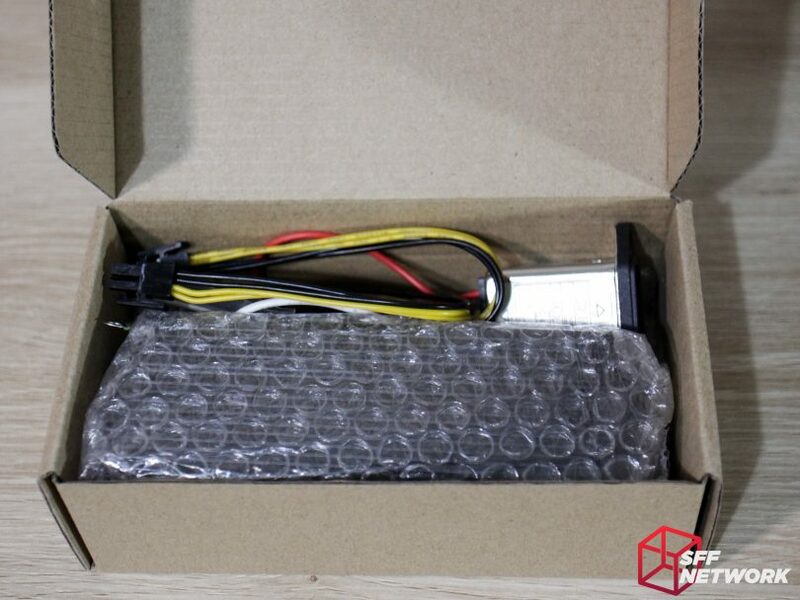 The power supply itself is well packed for such a small unit. The HDPlex 160W AC-DC itself is surrounded by a bubble-wrap bag, protecting it from any scratches to the powdercoat finish. Once again, the no-frills approach is evident. The first of the accessories – the two DC power leads. 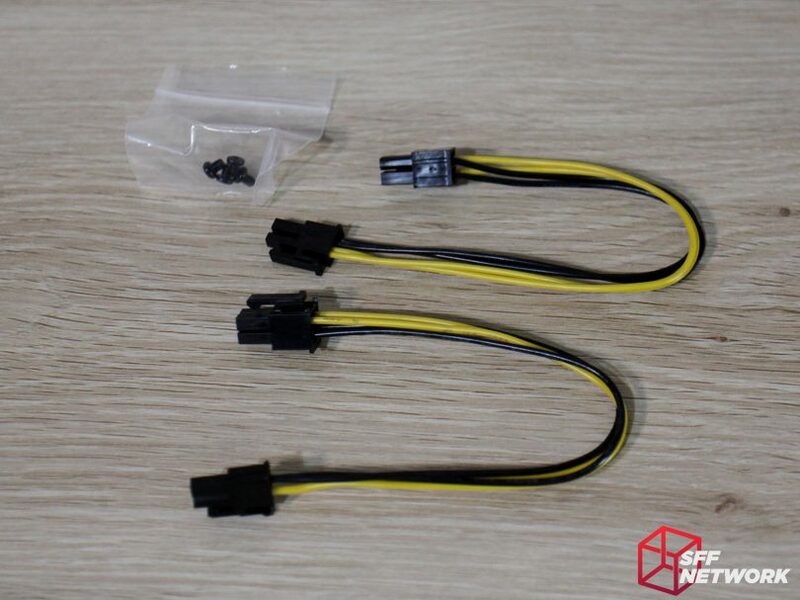 Included are a 4 to 2 pin and a 4 to 4 pin cable – perfect for use with 19v Thin-ITX boards with an internal power plug, or the HDPlex 160W DC-ATX Direct Plug power supply respectively. I do understand the no-frills approach, but some sleeving here would go a long way! 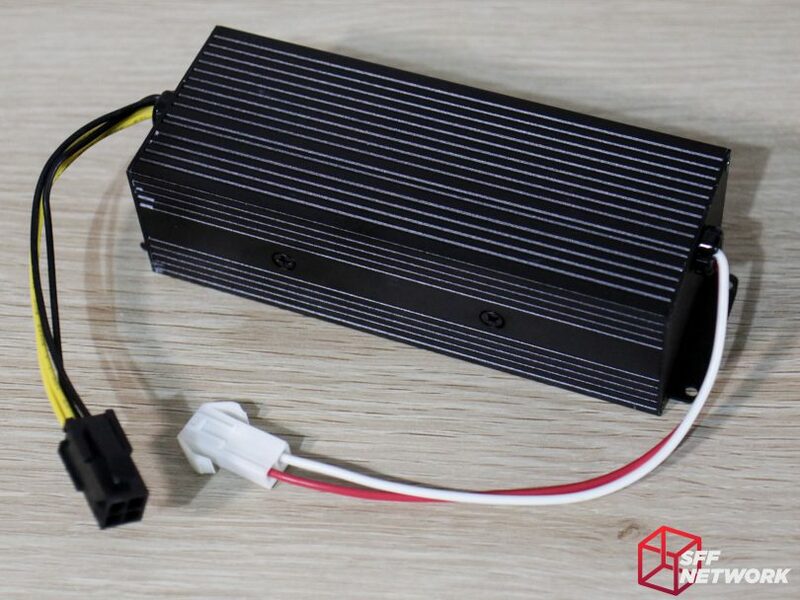 Also included is a IEC C14 socket for connecting mains voltage to your AC-DC unit. The IEC socket has inbuilt EMI filtering, a nice feature, albeit at the cost of extra depth within your chosen enclosure. 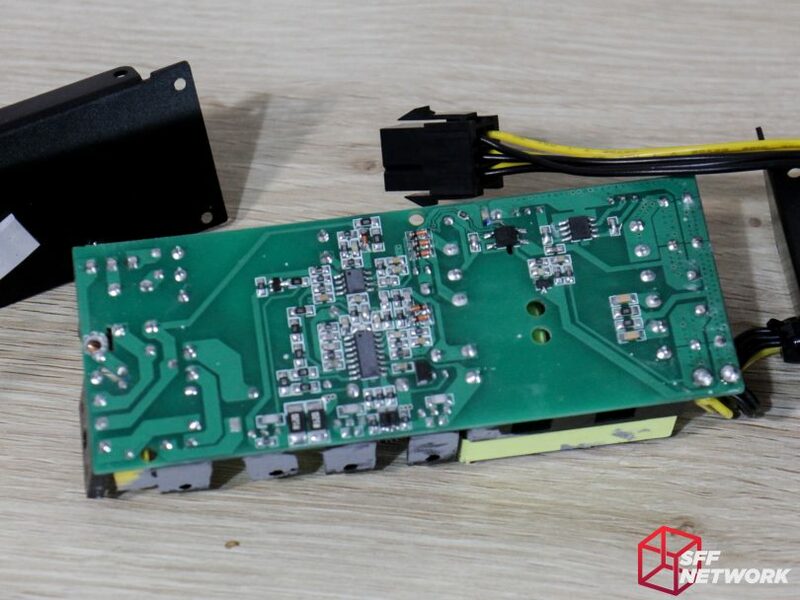 The presence of the EMI filtering here implies the lack thereof within the power supply itself – something to keep in mind should you choose to use your own power connector. Once again, cable sleeving wouldn’t go amiss (even adding a second layer of protection to the mains power on the cables)! For those keeping score, the live and ground wires are 24AWG, with the earth wire coming in at a thicker 18AWG. Blurry picture alert! 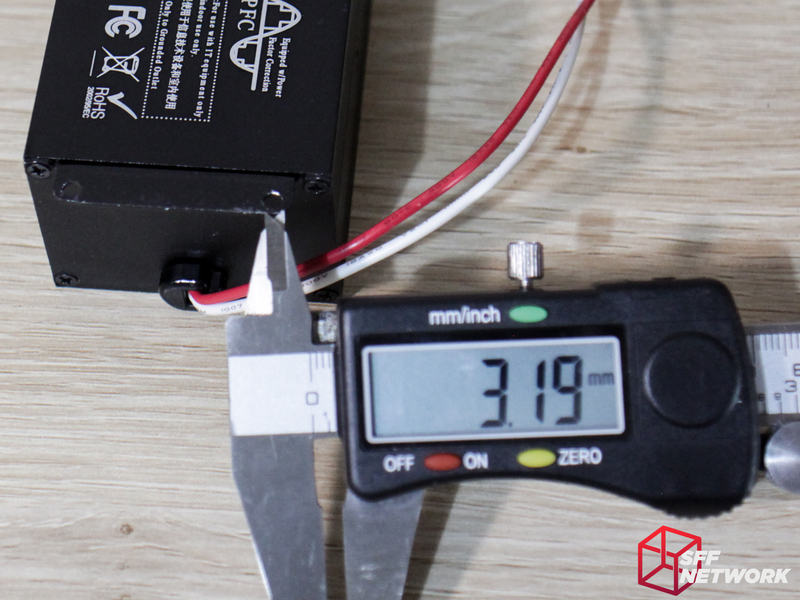 Both X and Y class capacitors are accounted for, as well as an inductor – more than some mainstream power supplies include! 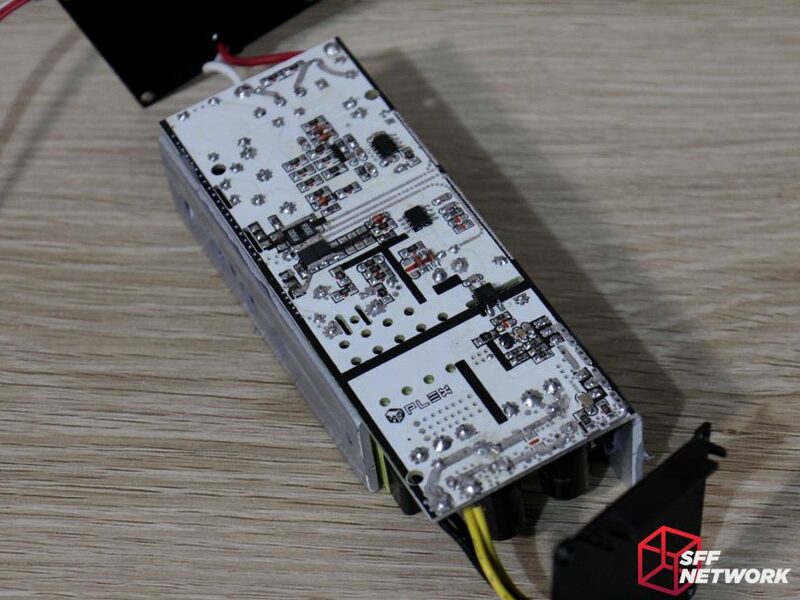 I’m pleased to see the inclusion of all these – considering the DIY nature of a lot of the enclosures we build in, the more noise filtering we can apply where we can, the more stable the systems will be in an otherwise “leaky” (in an electrical noise sense) chassis. 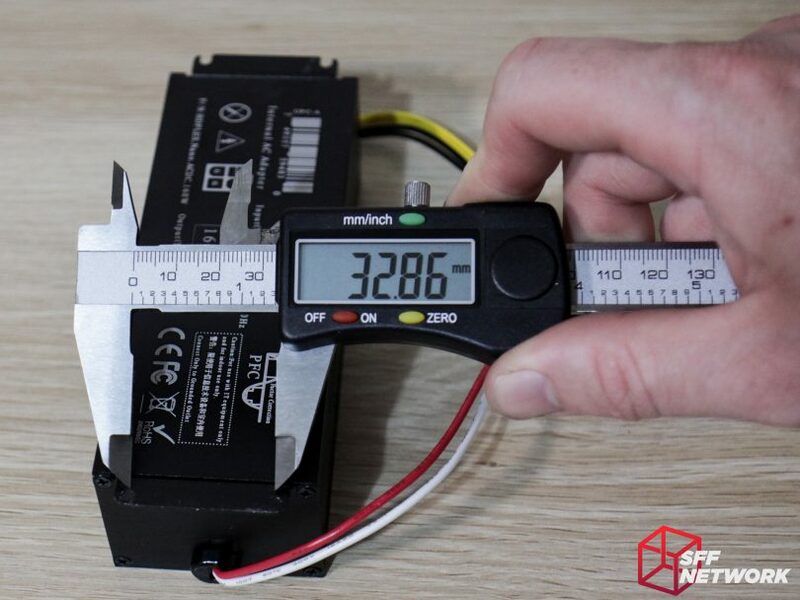 46.36mm deep, keep this in mind if your intend use case is particularly dense where you plan to install the power socket. 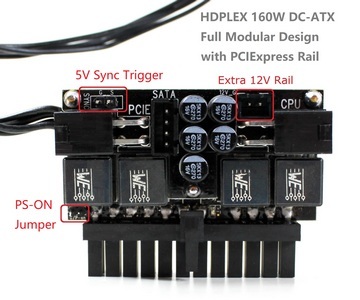 Now for the showpiece, the passively cooled, subtle unit that is the HDPlex 160W AC-DC power supply. Clothed in a somewhat robust black powdercoat, which will melt into the background of most systems, or add an industrial styling, depending on your location of installation. 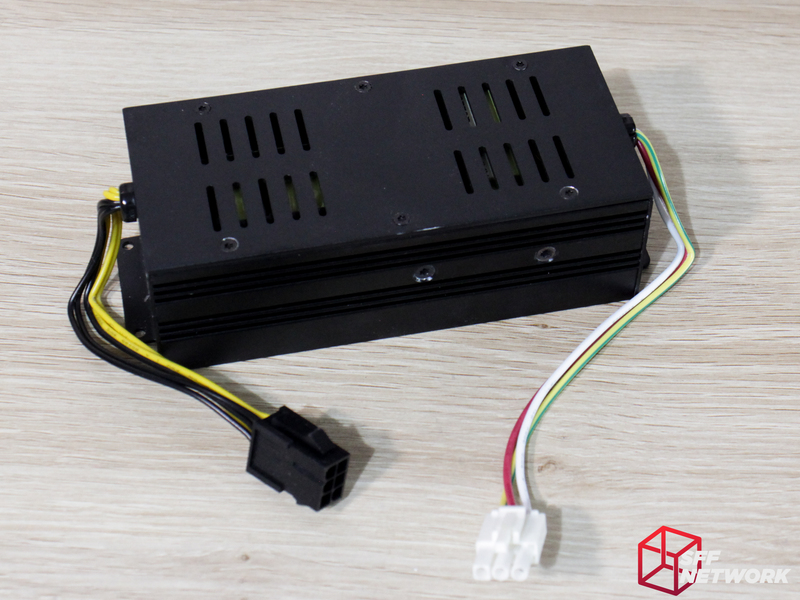 The 160W AC-DC has no ventilation holes – all the heatsinking is done by the extruded aluminium shell – which we will look at more closely in a short while. All the information you need is on the unit itself, including pinout, which is super handy! Who keeps manuals and packaging these days? The output wires measure in at 20AWG. 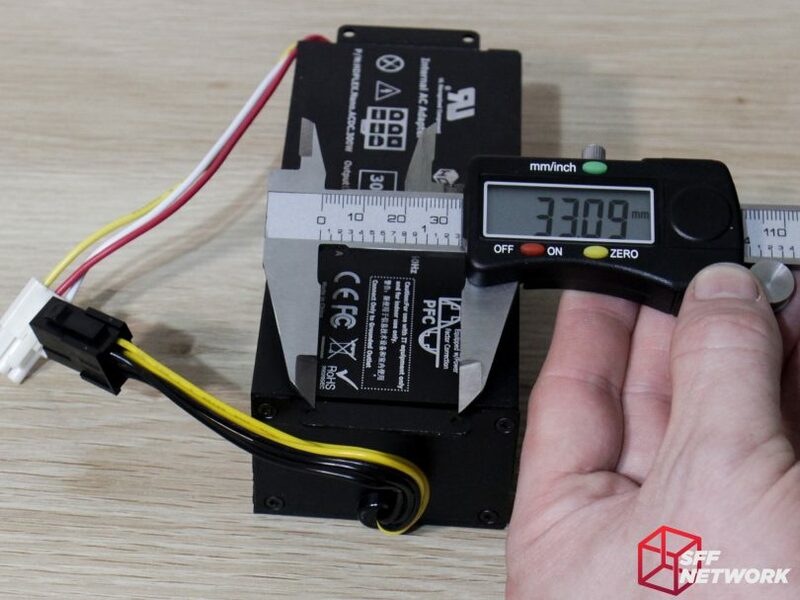 The unit itself measures 133.9 mm wide, excluding mounting tabs. Finally, the measure is ~40 mm thick. 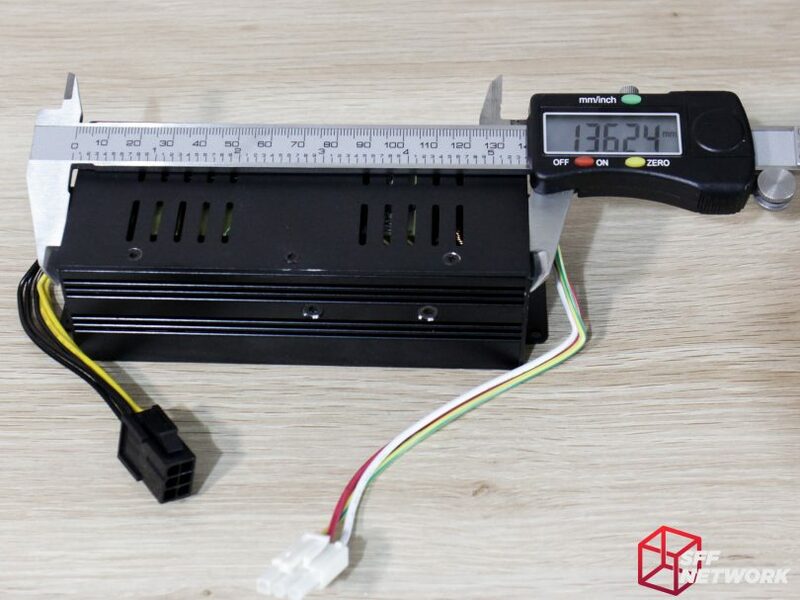 Including the mounting tabs, the unit measures 149.5 mm wide, with all other dimensions remaining the same. The tabs themselves measure in at 8.2mm wide. With the mounting holes coming in at ~33 mm apart. And the holes are 3.2 mm in diameter. 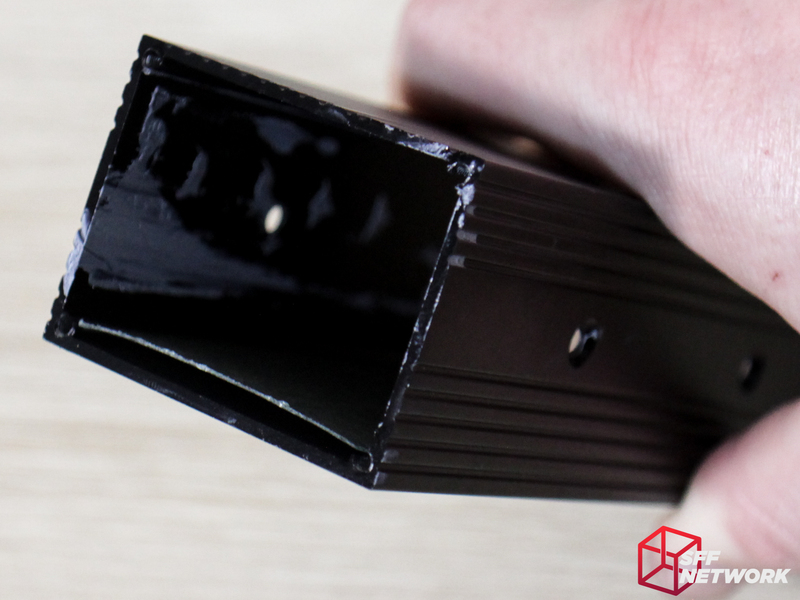 The shell itself is made from a section of extruded aluminium, which makes for a great heatsink. Taking a different look at the situation, it’s apparent that HDPlex has installed a relatively thick layer of insulation material, ensuring that there aren’t any fireworks when the unit is powered up. Also, it’s noteworthy that there are components mounted to the shell for heatsinking, hence the liberal quantity of thermal compound. I suffered the wrath of thermal compound on my hands so that you don’t have to! Now for the glory shot of the guts. 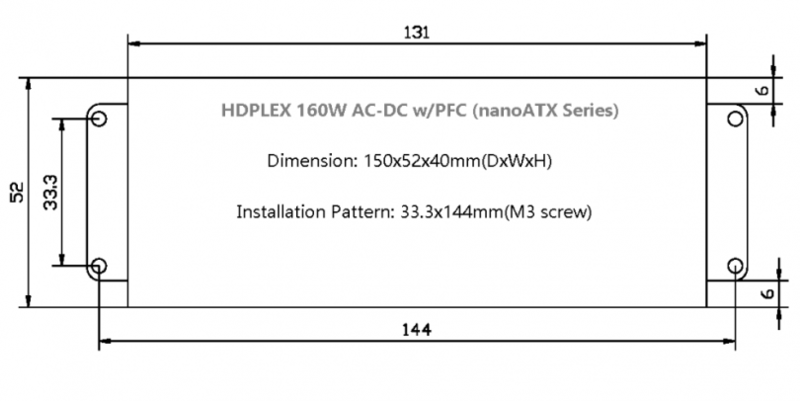 The design of the HDPlex 160w AC-DC is insanely dense, just how we like it. In fact, the density rivals many high end laptop power bricks, which is great to see for what is in effect a low volume production product. This large Chong branded cap is rated for 105C. Good to see a high temp rating on a cap inside such a dense power supply. Not sure on the brand though – it’s not one of the high end name brands that we’re grown to trust. The PCB itself is silkscreened in white, with seperation areas marked in black. Also notable are the holes drilled into the PCB for ventilation and seperation, a nice touch. The solder work is of moderate quality, with extra solder added to some tracks to aid in current handling capacity. I do question the “splatter” to the right on the PCB! NOTE: The linked components here are links to PDF datasheets! Lets walk through from the AC input end. 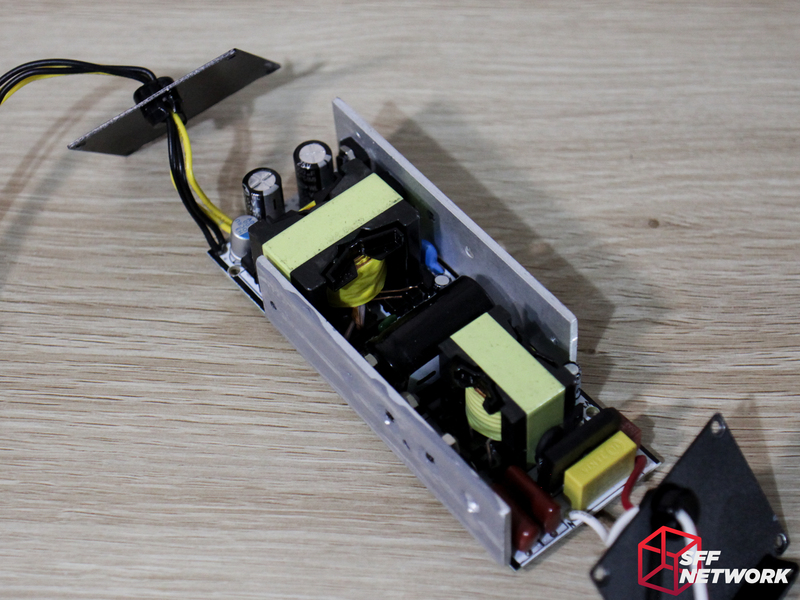 We do see an X2 class capacitor (TENTA MKP 275VAC, 0.1uF) across the input, adding to the filtering and suppression that is present in the included AC socket. It also appears that above this lie a pair of capacitors (ZX474J 250MKP) – HDPlex has really gone all out on the filtering and suppression. Top marks here. Going right, we see a bridge rectifier, a GBU 1010, rated at a maximum of 1000V, and a peak current of 220A! Continuously though, this rectifier is much happier at 10 Amps, giving us a theoretical 2300 Watts at 230V. Below this sits a fuse, rated at 5 Amps, bringing the capacity of the board down a little bit (although still way above the rated 160W !). Continuing on, what appears to be a transformer sits next to a 47uF 25V 105C cap (made by Huahong), before heading to the aforementioned larger Chong capacitor. This Chong capacitor is a 100uF 400V rated unit. Before we go any further, we have to check out the three TO-220 packages at the top of the board. From the left we have a single LTTH1206DF rectifier, performing PFC duties. Next to this are a pair of TF18N65 N channel MOSFETs. Sneakily hiding infront of these is a lonely diode, (not shown) that I couldn’t find the markings on. Flipping the board around, let’s start heading towards the output. Another lonely diode sits out of sight under the green capacitor here – a film capacitor of 4700pF rating. Another cap, another Huahong 47uF 25v part is mounted above this. To the left, we have the output transformer, a beefy unit! A Y class capacitor (JN222M) sits hidden above the transformer. 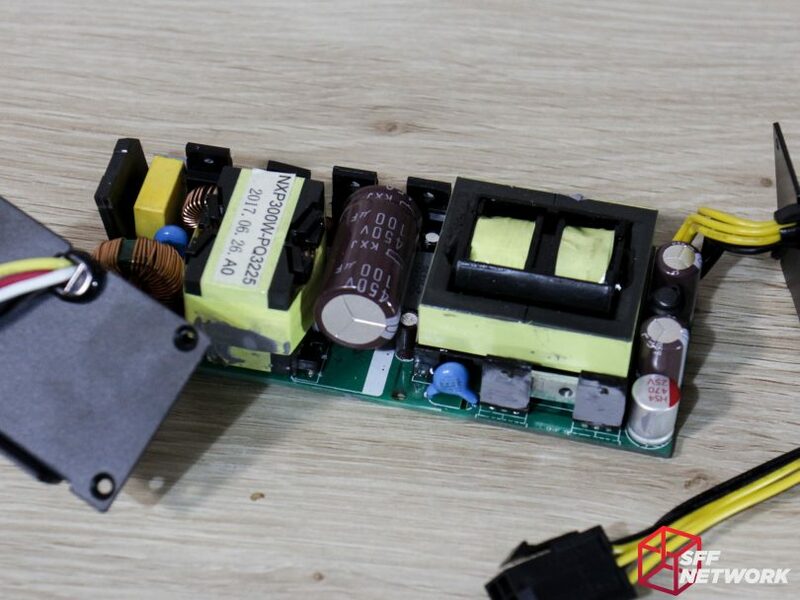 To the two TO-220 packages mounted to the heatspreading bar above the transformer, we find a pair of VF30100A Schottky Rectifiers, rated to handle a continuous 30A. Finally, nearing the output, we have a pair of 25V, 1000uF capacitors. 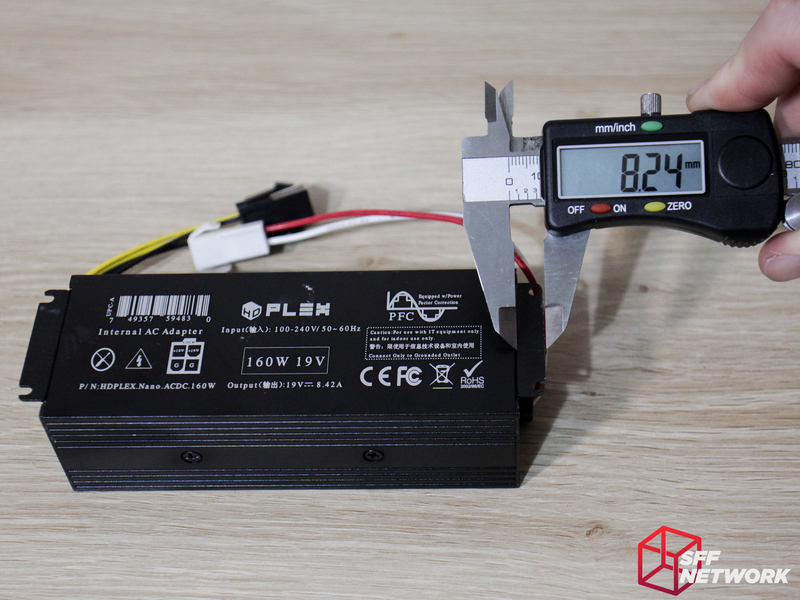 Last but not least, a poly cap of 100uF and 20V rating helps smooth the final power output. On to the bigger brother, the 300 Watt variant. 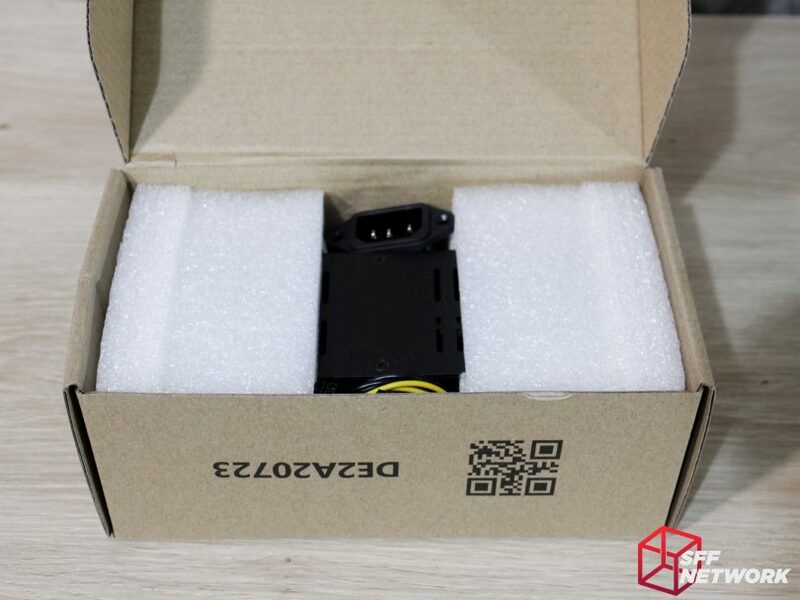 Even more robust packaging is used, with foam end caps supporting the power supply in transit. Included in the package are a pair of connection cables, one for a HDPlex DC-ATX unit, the other for some thin-ITX boards. 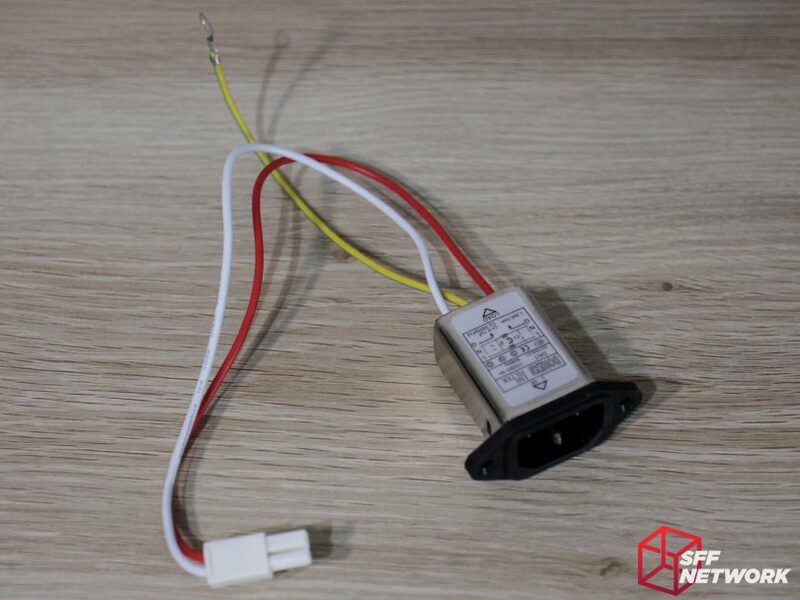 A similar IEC C14 plug is also included, although this time the wires terminate in a 3 pin connector, rather than the earth wire having a ring terminal termination as with the 160W above. 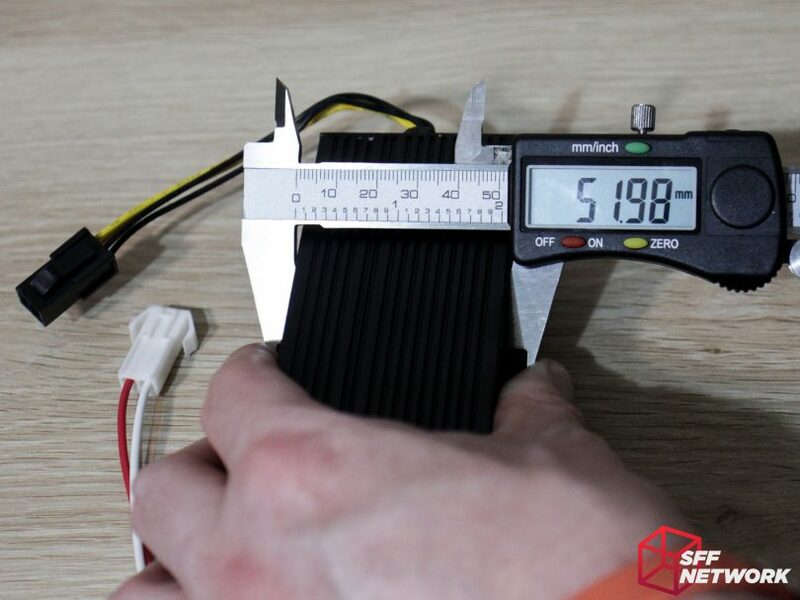 The first thing we notice about the 300W is that the top cover is ventilated, which is to be expected to enable extra cooling – the 300W isn’t that much bigger than the 160W! Also, there is a move from the 4 pin Mini-Fit Jr to a 6 pin variant – better for the higher currents available. Please ignore the thermal paste on the screws – this image was taken after the tear down as the original was blurry. Woops! 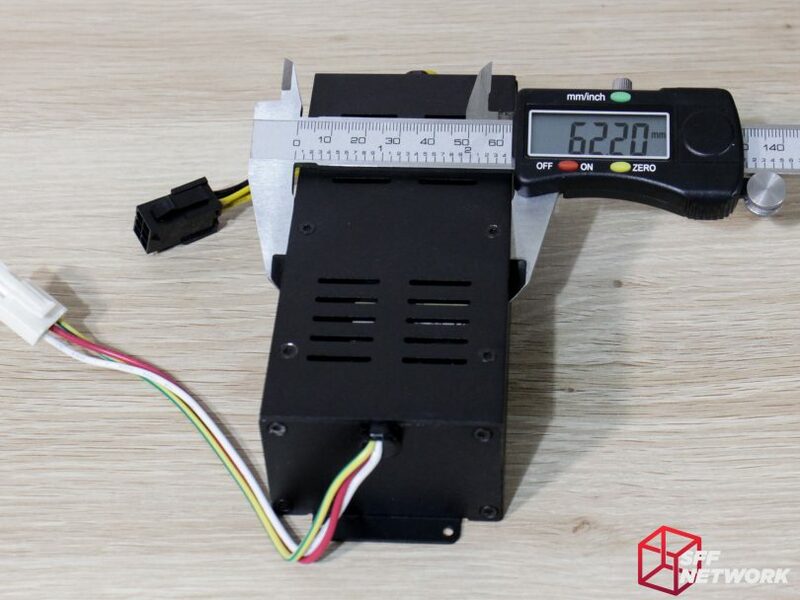 At only 2mm longer than the 160W, this unit will fit in most of the same enclosures if this axis is the only restriction. The extra size of the unit is mostly in the width – an addition 10mm is found here. Once again, the core information is printed on the unit. 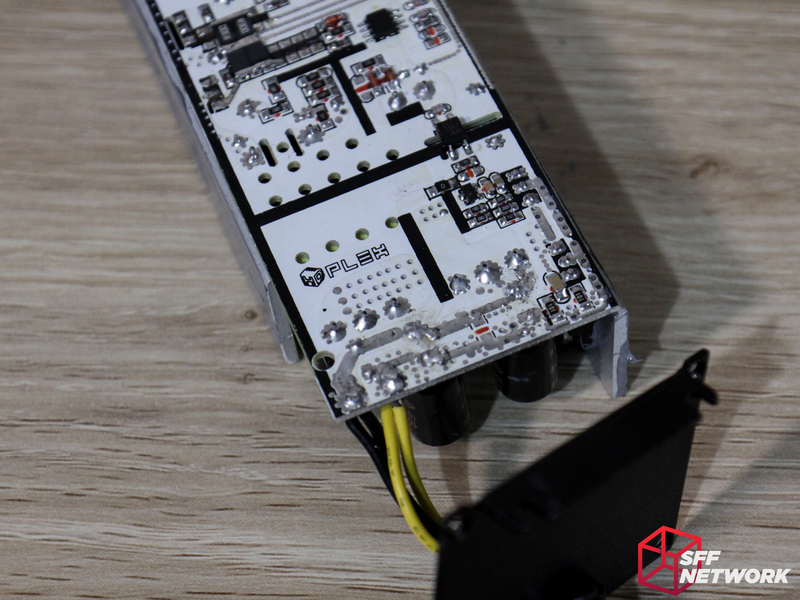 Whilst the overall length of the unit is 2mm larger than the 160W, the mounting holes are the same! Wow, these are much different internals compared to the 160W! 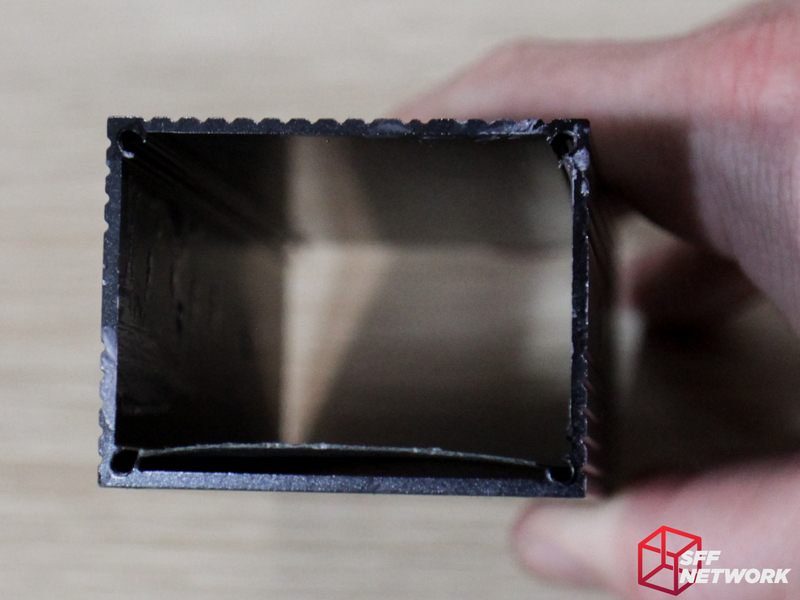 It’s clear that the enclosure is made from a different extrusion, in a “C” shape rather than a complete box. The top lid screws in with 6 small hex head screws. 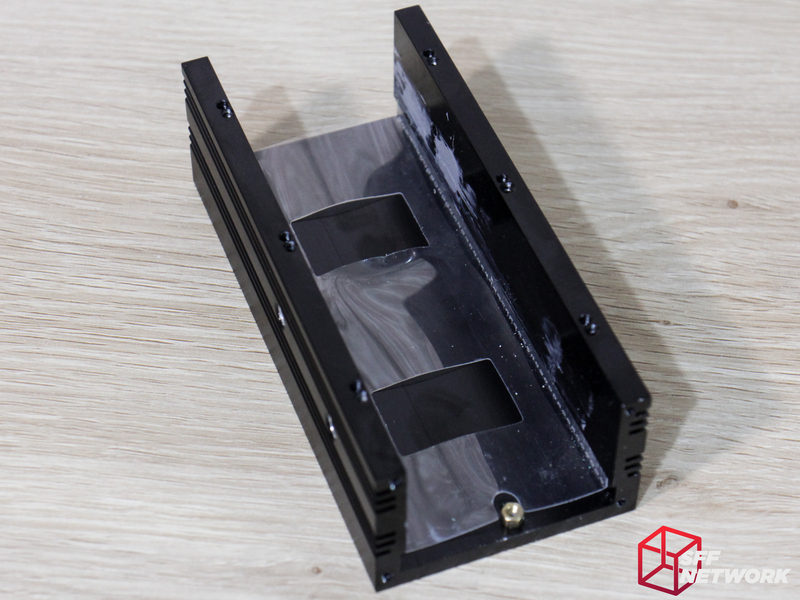 Protecting your system from a really bad time is a sheet of plastic, insulating the PCB from the case. This PSU was much easier to disassemble than it’s smaller brother! 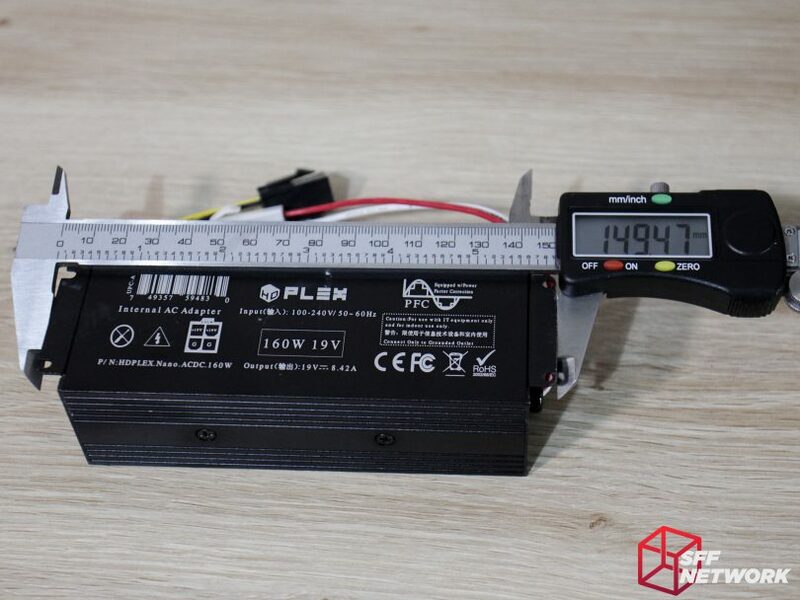 Just as dense as the 160W, this really is a well designed unit from a first glance. Let’s get our fingers covered in thermal compound, and dig into the finer details. 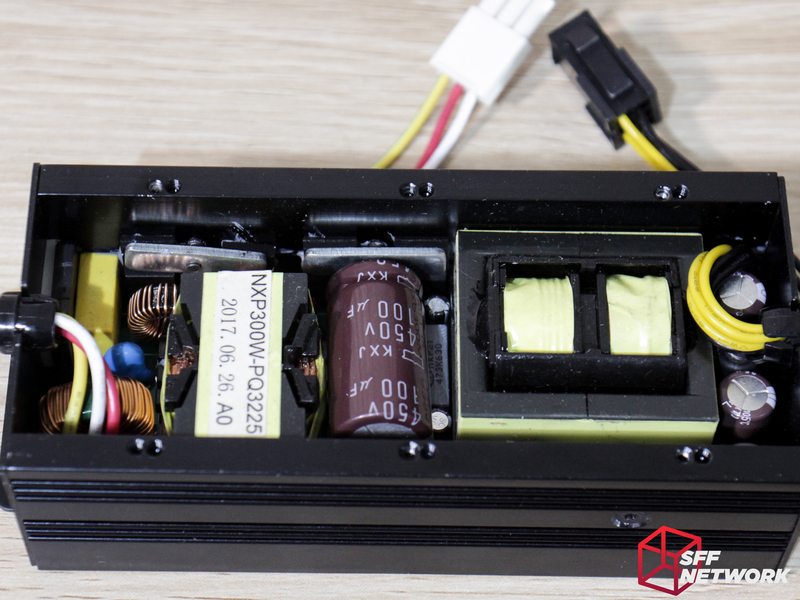 Starting from the AC input side, we have first, a 5A plastic fuse, the same unit as the 160W. From there, we head into a chunky inductor. Next up, a pair of Y-Class JN222M caps, and a 0.22uF X-Class cap. 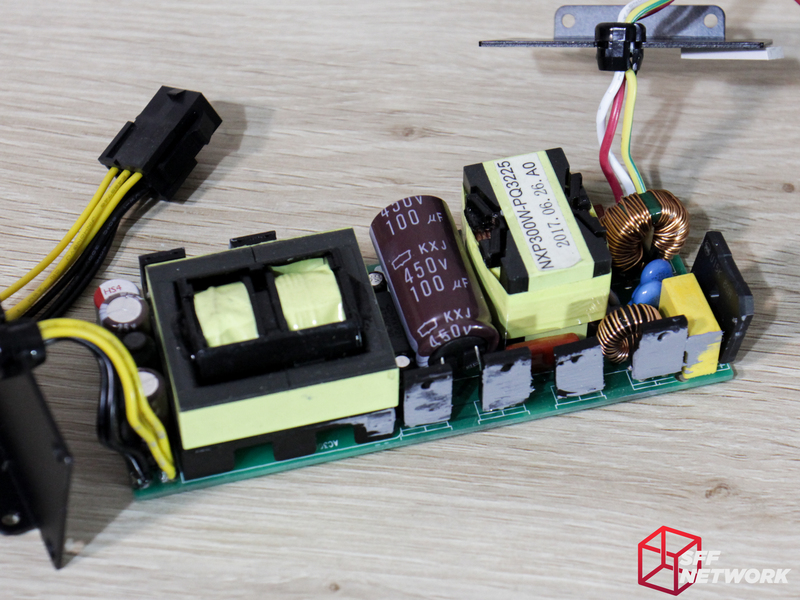 The bridge rectifier package is a U15K 80R unit, rated for 200A peak and 15A continuous. Another inductor sits here, nestled between the X class cap and the first of the TO-220 packages. 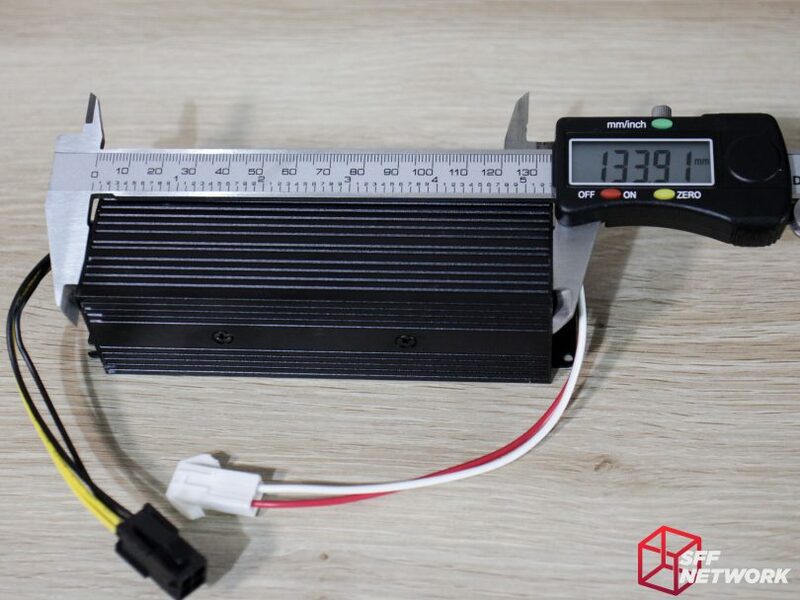 In order from right to left, we have a LTTH1206DF rectifier, for active PFC, a TK22A60V N-Channel MOSFET and a pair of CMF20N50B N-Channel MOSFETs. These all surround a transformer. Above the line of MOSFETs lies a small GBB22 capacitor, next to the Nippon-Chemicon (a fantastic brand!) 100uF 450V electrolytic. Next in line, a trio of caps – a Nippon-Chemicon 47uF, 25V in brown, an 0.047uF film cap in the grey plastic shell, and finally a ChongX 10uF, 50V unit in black to break the Nippon-Chemicon streak. 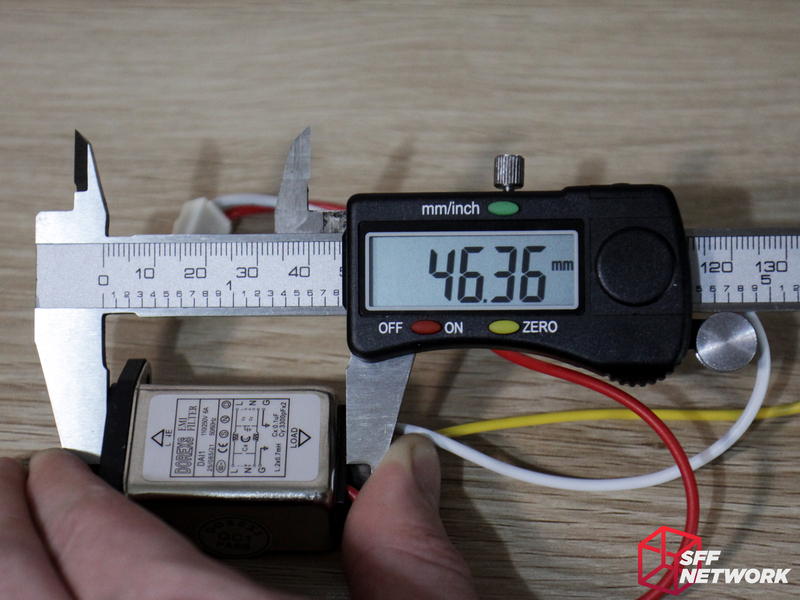 All capacitors in this power supply are rated for 105C, which is very important. On to the DC end. Under the absolutely giant output transformer, a Y-Class cap that matches the ones on the input stage is found. Next to this is a pair of N-Channel PSMN3R9 MOSFETs. Onwards to the exit, we have three more capacitors and an inductor. From the bottom, a 470uF 25V Nippon-Chemicon cap, a 1000uF 25V Nippon-Chemicon electrolytic cap, the aforementioned inductor, and another 1000uF 25V Nippon-Chemicon cap. Not a bad roundup of quality components, with maybe only the ChongX cap as the weak point, quality-wise. On the rear of the board, we see a few IC’s, unfortunately the largest one and it’s neighbour have been shaved, removing any identification marks. 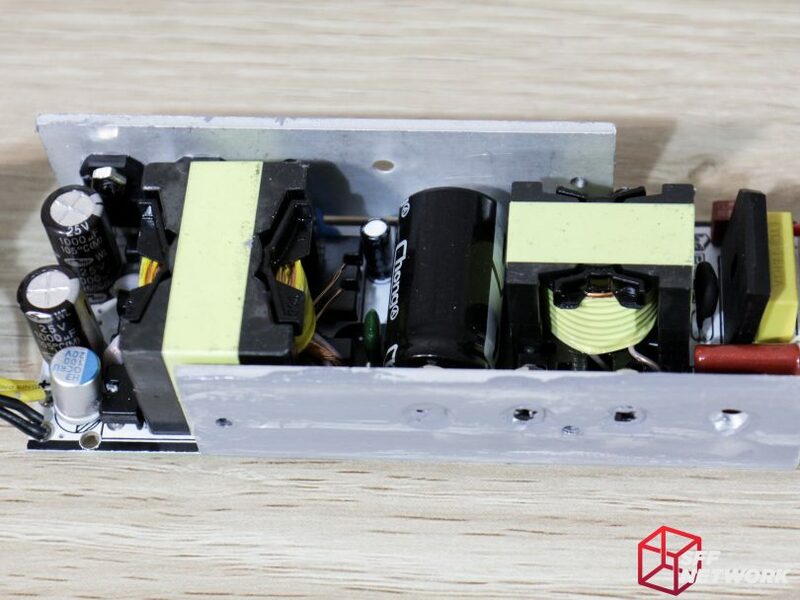 Apart from this, we can see that clear separation between AC and DC areas of the board is apparent, some of the largest gaps between traces I’ve seen in some time – excluding the area around the feedback opto-isolator, of course. All in all, a well designed product. So, want some more flexibility in your build? Slot one of these in! 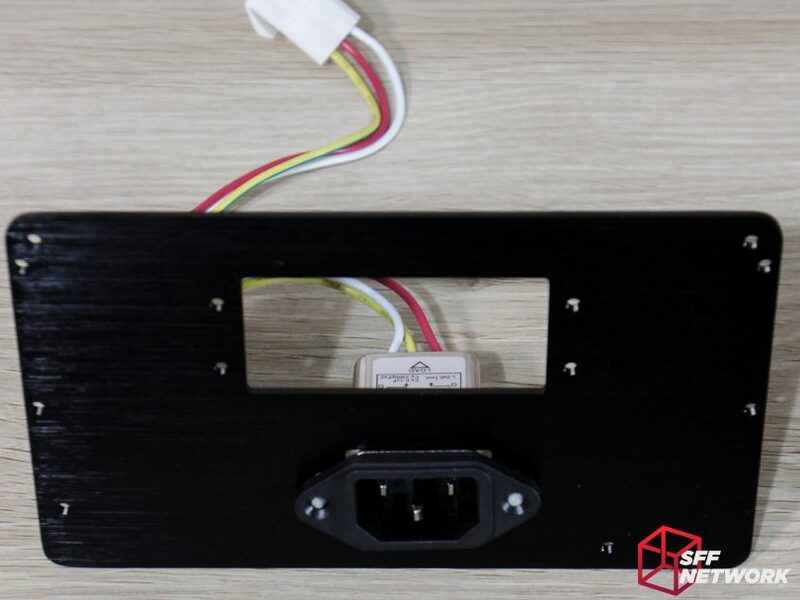 Using the HDPlex adapter plates in and put your AC-DC wherever you want.. including on the plate itself in the case of the ATX variant! 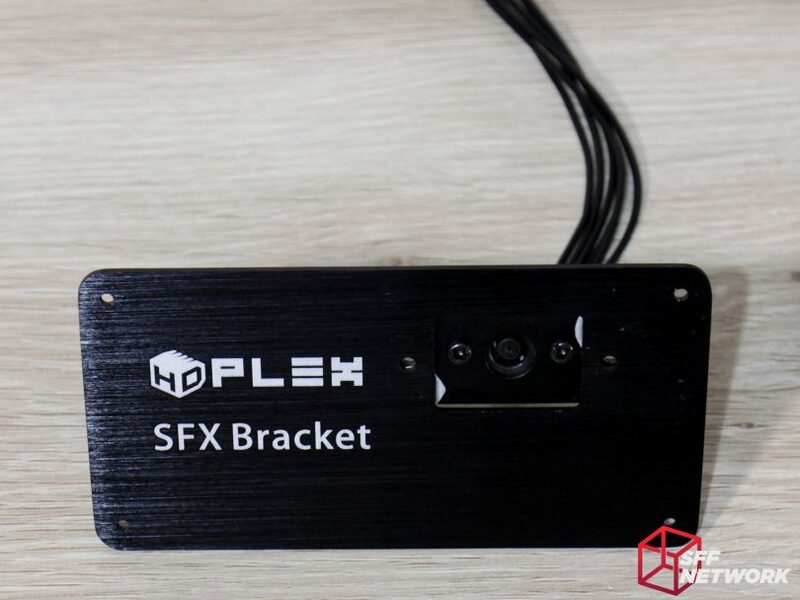 The SFX bracket converts a SFX opening into a power socket mounting plate – handy for those cases with the power supply above the CPU cooler. On to the ATX variant. 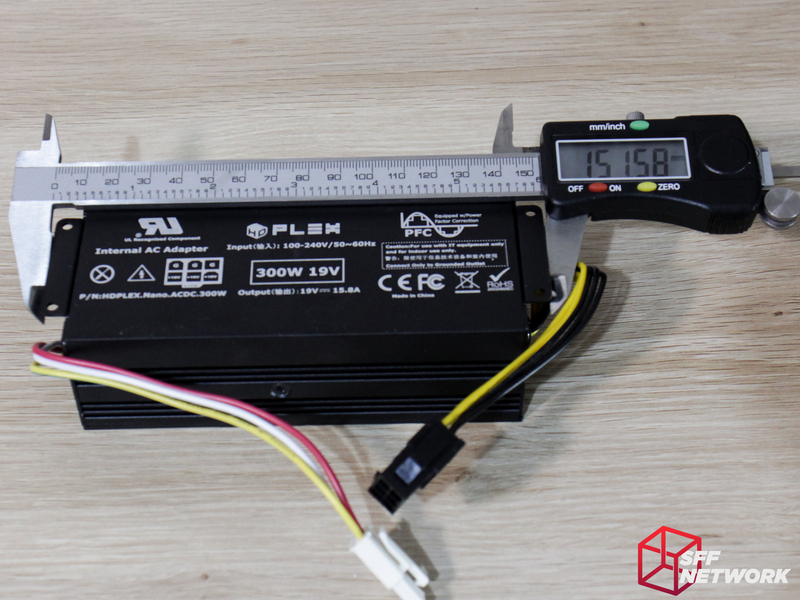 The plate mounts the IEC power socket, as well as your 160W or 300W HDPlex AC-DC unit. 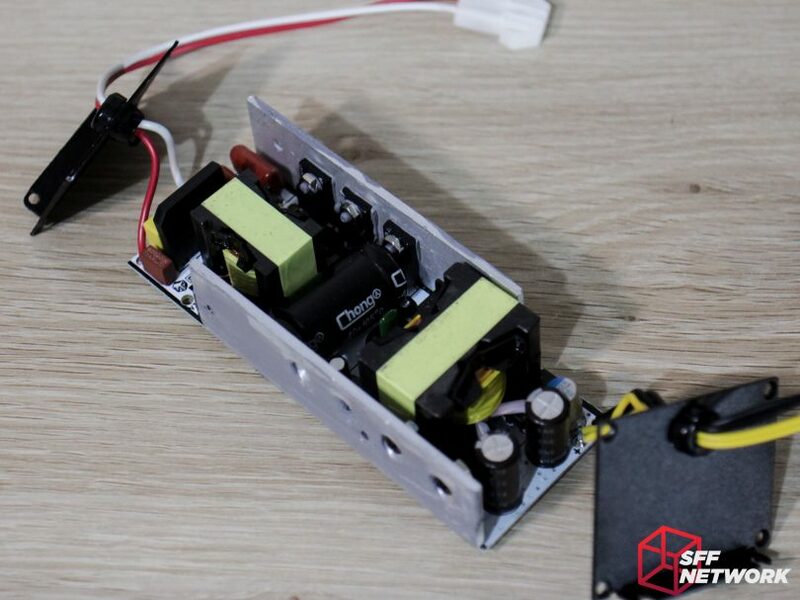 Before we conclude this review – there is also a plate allowing you to mount the DC-in jack to run an external power brick. 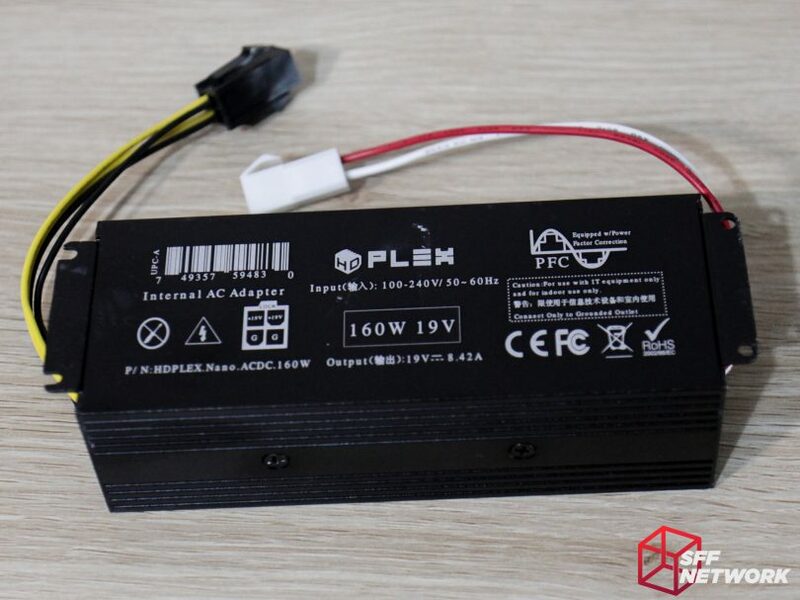 HDPlex’s AC-DC offerings are solid, well built, and well thought out, especially if you compare them to the equivalent wattage external power brick. Under load testing with various systems over the past few months, all protections have worked when tested, and they have held up to appropriate loads thrown at them. I have used these two power supplies extensively, and will continue to do so, for testing systems. powering servers and benchmark machines and the like. Well done HDPlex. No coil whine has been apparent on these units (or the 300W unit I personally own to run my KMPKT Dynamo Mini Prototype), which is a good sign that quality continues to improve over original units that the community reported as having some issues with this. If I had any criticisms, it would be to be more consistent with top tier capacitors in production, to aid longevity in what will be a hot running power supply option. The HDPlex 300W AC-DC is available from HDPlex.com for US$78.00 including shipping. 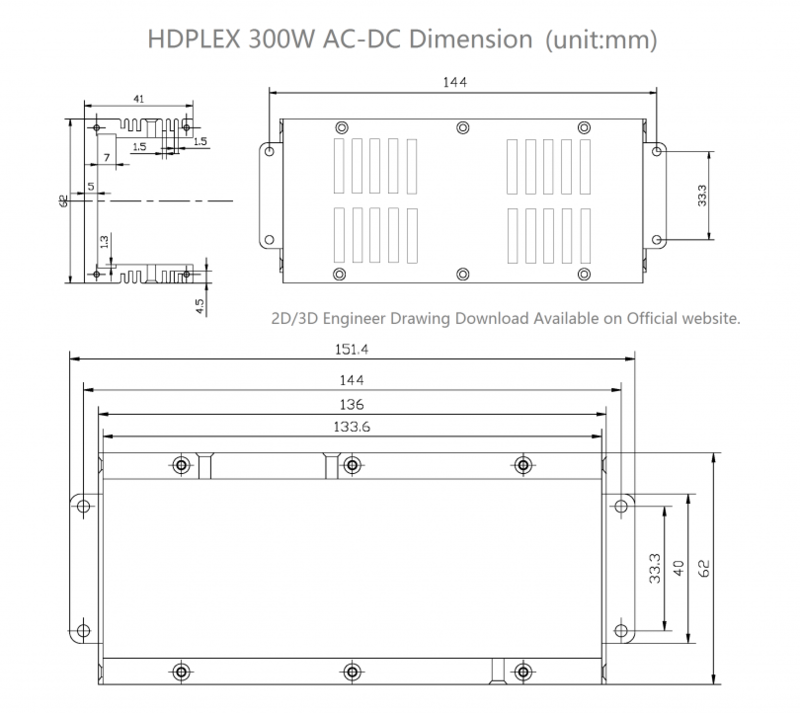 The HDPlex 160W AC-DC is available from HDPlex.com for US$45 including shipping. 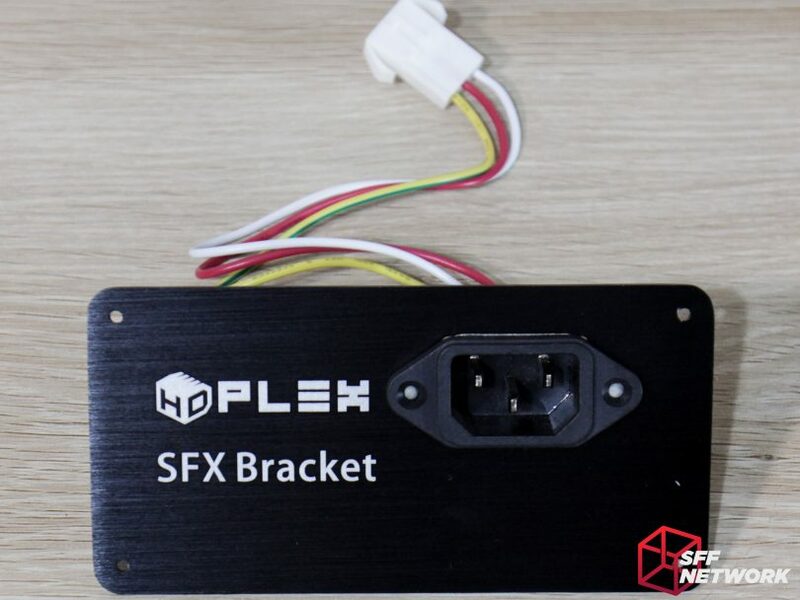 The HDPlex ATX adaptor plate is available from HDPlex.com for US$3.50 including shipping. 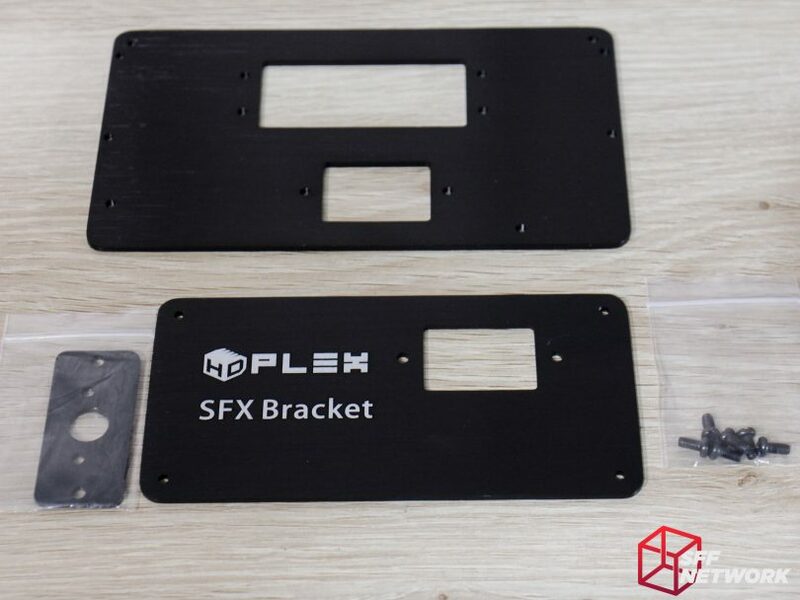 The HDPlex SFX adaptor plate is available from HDPlex.com for US$3.50 including shipping.